There is so much to write about in Penang, I do not even know where to begin. Okay lets begin with our journey up to Penang to start. It was 26th December, the day began very early morning when everyone is in deep slumber, however I do suspect some people were religiously attending BodyCombat class all. Sayang and I had other plans, although it was not a good one, we were going to pig out for the next few days. It began 6am, Sayang was already preparing to come over to pick me up for the trip up. I was still in slumber knowing that my stuff were all packed. By 9am she already had half a day ahead of me in terms of activity, while mine began. First assignment - Cari Sarapan Pagi yang sedap !! Kuay Teow Thng, Loh Mai Kai and Char Siu Pau,hardly the breakfast for champions but it would suffice until we reached Ipoh to look for the legendary Taugeh Ayam. Anyway the breakfast was actually randomly selected at a random breakfast place in Taman Midah. Not bads. After breakfast we stopped by at Giant to get some water and junk food to accompany us on the way up. 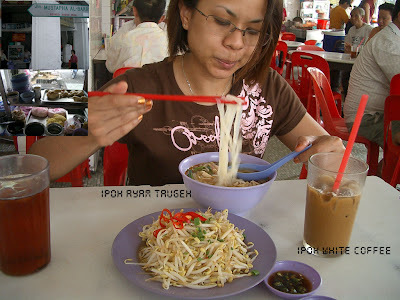 As soon as we were done we really got on our way up to Penang via Ipoh first. A pitstop to refuel or tummies. The hunt is on for Taugeh Ayam. A mission that sounds quite impossible, because, neither of us are familiar with Ipoh town. The drive up to Ipoh was relatively quick, we were both excited and full of energy. It was filled with hope as to what we food we would eat and how fat we would all become. We reached Ipoh with a slow cruise up, nothing much to see on the way except for a truck full of cute pigs. So we managed to stumble upon the famous Taugeh Ayam restaurants in Ipoh. It was closed and they will only open for dinner that day. Alamak !! So we walked around and stumbled on this huge sign . So we walked in and tried a bowl of their tau foo fa. It was ok la, to be frank I do not know what is different about this tau foo fa, but when you put it into your mouth, it was firm and soft at the same time. Many people came to this shop to order take away. 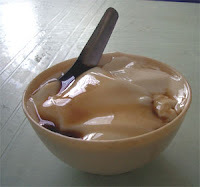 Something new, Tau Foo Fa, famous stall in Ipoh. We asked the tau foo fa shop owner where else can we makan Taugeh Ayam. They gave us directions, but told us, this stall not a famous one. So we headed off to those directions. We saw one corner stall, at Jalan Mustapha Al Bakri. We got our White Coffee ( so so only the taste) and our taugeh ayam. The kway teo was smooth, just like ipoh kwai teow the soup was nice. Quite tasty. After a late lunch we resumed our journey up to Penang. It was a slow drive , which took us an hour plus. We stopped by Sg Perak R&R to do some business, and stumbled upon a stall which sells Tongkat Ali capsules. Did not buy them, but it seems like a good deal. Rm12 for 30 pills. 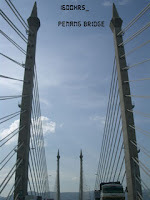 So we reached Penang at about 4 in the evening, checked in to the hotel and rested . The bridge is a magnifiscent view and this one taken from the cockpit of the car. Lovely. It was to be an adventure for the next few days. The mission is to find the best char kwai teo on earth. The best prawn mee and the best Cendol / Ais Kacang, etc. Oh ya, this one is new, Roti Babi.... muahahahaha.